Last week, for the first time in our three years as business owners, we were robbed. When Jay called to tell me that someone -- likely a current or former employee based on our current investigation -- snuck into the shop overnight, stripped our cash register and stole whatever was left behind in the petty cash drawer, I was furious, insulted and hurt. During our tenure at our shop, we've always done our best to make it not only a comfortable space for our customers, but also a comfortable space for our staff. We pay livable wages. We offer free food during shifts. We allow our employees to express their individual personalities by wearing whatever street clothes make them feel best. When our company takes part in big events, such as summer concerts and festivals, we hand out hundreds of dollars worth of free tickets so that our crew can enjoy a few fun nights out with their friends. We permit cell phone use and smoke breaks and rarely get pissed if someone shows up to a shift fifteen minutes late or needs a last minute day off. We dole out advances when our employees are faced with difficult times. We provide cash bonuses at the close of crazy pop-up markets or seasons as a thank you for a job well-done. We use mistakes as teachable moments and allow our crew's input about cool new menu ideas. We usually just laugh when our twenty-two year old counter workers show up still reeking of last night's booze. Overall, I think our philosophy is and always has been this: We get it. We've been there. We might own this place, but we're still humans too (albeit mildly dysfunctional ones from time to time). So when I learned that someone who recently was or still is a part of our team violated us, it felt like the ultimate slap in the face. Was this person that desperate for some extra cash, and if so, why didn't he just ask us for a little something to help float him until the next pay date? Was this person in trouble and at a horrible low point and, if so, were we that blind as bosses to identify such a problem? Was this person out to prove something -- to himself or to his friends maybe -- or out to stick it to us (i.e. : did we, as shop owners, somehow become "the man" and, therefore, someone worth "sticking it" to)? Although my brain kept reminding me to be angry about the missing money, I found myself growing more and more pissed about the fact that 1) someone we trusted and believed in turned his back on us and violated our sense of trust, 2) someone felt we sucked that much as bosses that he didn't feel comfortable coming to us and simply asking for whatever he needed so desperately, and 3) some current or former employee thought we were dumb enough not to notice our shop's cash flow, which infuriated me most of all. Immediately following this unfortunate "sticky fingers" incident, Jay made phone calls to several of our friends who also own small NYC restaurants, pop-ups, food wholesale businesses and the like. It turned out we weren't the only ones who ever dealt with a greedy employee. In fact, the majority of people we spoke with admitted that they discovered employees skimming a bit of extra cash off the top of the stack within their first year of operation. Sad news, though I think it made us feel slightly better that we weren't the only foolish shop owners who have ever been "had." Now that we are just a week shy of our shop's one year anniversary, we've learned a lot. For one, we've learned how hard it really is to be the boss. As our business grows, we can't be physically present in the shop nearly as much as we were present at the start of things. If our business is going to grow, then as owners we need to step away from the shop to take part in meetings, to spend time scouting out new markets and new spots for additional locations and doing a whole lot of not-fun business stuff that far exceeds whipping up new condiments in our kitchen. In our absence, we need to trust that the staff we've trained will prepare our recipes just so, that they will show up when they're supposed to show up and that they will complete all their daily tasks before they leave. We also need to trust that they won't rob us during the times when we need to step away. In addition to stepping away from the shop for meetings and all that fancy business stuff, we've also periodically stepped away from the shop this summer to have, well, a life. Trust me, it's been a pretty hard thing to do. I imagine it is what a young mother feels like the first time she leaves her child in the hands of another caretaker. Terrifying, yet necessary for one's own mental health. At the start of this summer, when our employee roster grew to fifteen, we knew we needed to begin to occasionally step away. Although during most of the year, weekends at the shop can be kind of insane, New York City tends to clear out on summer weekends, and so we figured we'd take baby steps and use these quiet periods as times for us to begin to step away. For the past month, we've been heading to the shop on Saturday mornings to drop off food and make sure things are running smoothly, then scooting down to the Lower East Side for lunch (I really ought to tell you more about our recent lunch at Momofuku, but more on that in another post), briefly popping our heads back into the shop to take care of any minor disasters (they always -- ALWAYS -- pop up) and then leaving to enjoy the rest of our weekend, our full confidence left in our staff. Although I've enjoyed all our Sundays spent together, I'm wondering if perhaps some of our temporary seasonal staff members (i.e. : those staff members who, in reality, we've only known a few weeks and who therefore do not know us or our business practices very well) misinterpreted our time away. Maybe they thought we were crappy business owners for not sweating it out in our kitchen twenty-four hours a day. Maybe they thought we were stupid and didn't pay attention to our sales. If only they knew that, even on those days spent outside of the shop, we are never really away. In between all those peaceful moments, we're constantly touching base with our managers, calling different purveyors, our fingers constantly tapping our cell phone screens so we can access the many apps that keep us up-to-date with shop sales, deliveries, catering concerns, payroll, schedules, invoices and spreadsheets. 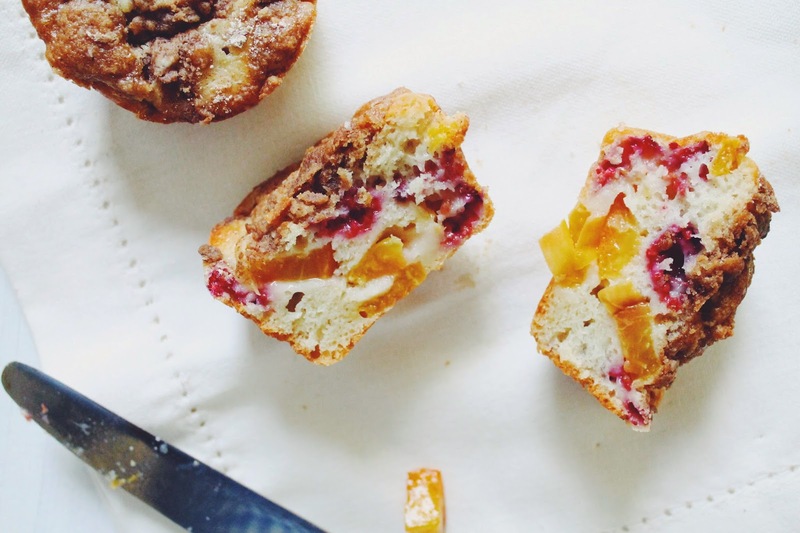 These Peach & Raspberry muffins are one such treat I've made on a recent quiet weekend. 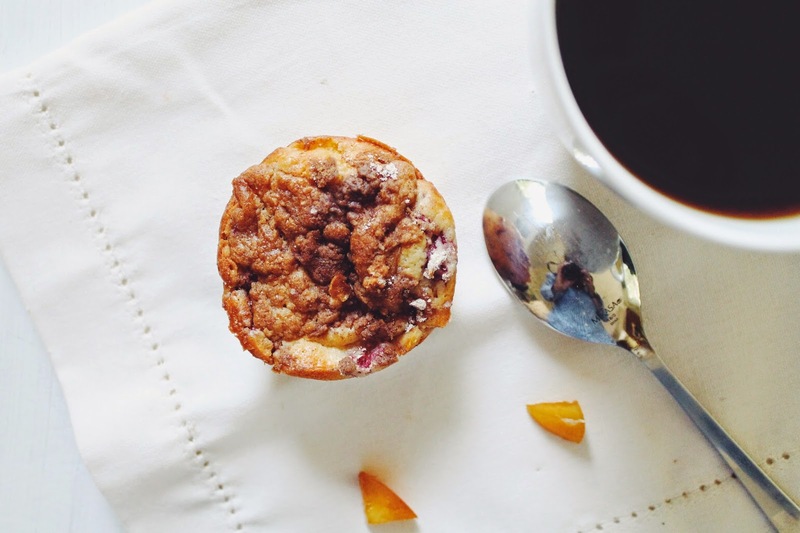 The recipe calls for a generous amount of fruit, meaning that every bite of these muffins includes a taste of sweet, ripe peaches and tart berries, as well as a satisfying cinnamon and honey crumble. Plus, instead of oil, this recipe relies on Greek yogurt, which turns out an incredibly moist muffin that seems completely acceptable for breakfast. Likewise, I've also discovered that is it one hundred percent acceptable to face a half dozen of them while testing out infrared security cameras (say "cheese"!). Although it is already August, a few weeks worth of summer Sundays still remain, as do several weeks worth of high summer produce. I hope you get to enjoy it all. Preheat oven to 350 degrees. 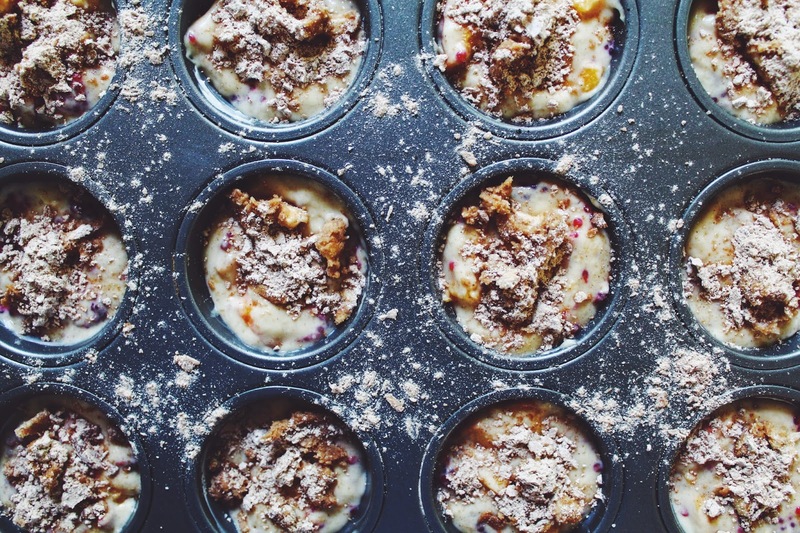 Lightly grease muffin tins. Melt the butter in a saucepan over low heat and set aside to cool. In a medium-sized bowl, mix the flour, baking powder and salt. Set aside. In another medium-sized bowl, whisk the egg. Add the sugar and the vanilla and continue to whisk until thick and creamy. Add the almond milk, butter and yogurt and stir to combine. Combine the egg mixture and the flour mixture until fully incorporated. 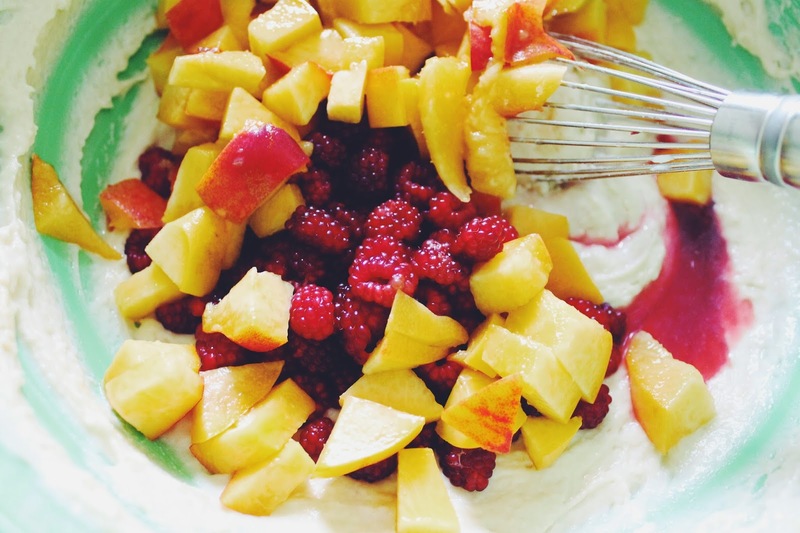 Fold in the fruit and set aside. 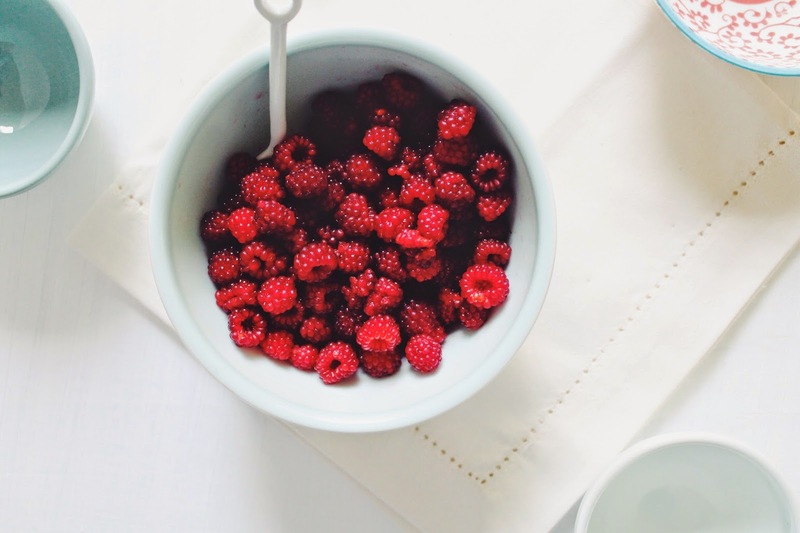 To make the crumble, add all ingredients to a small bowl and mix by hand until a crumble begins to form. 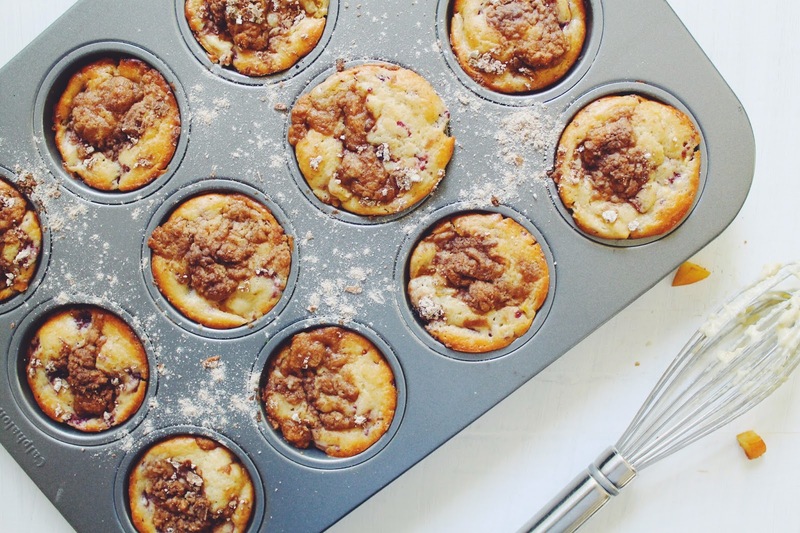 Pour the batter into the muffin tins until they are about 3/4 full. 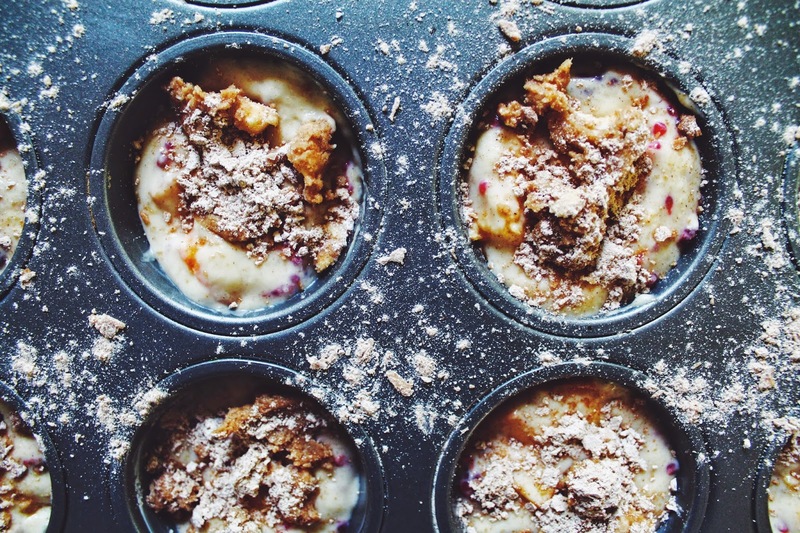 Top each muffin with a generous amount of the crumble. Bake the muffins for 35-40 minutes, or until the muffin and the crumble are golden brown and a toothpick inserted into the center of each muffin comes out clean. 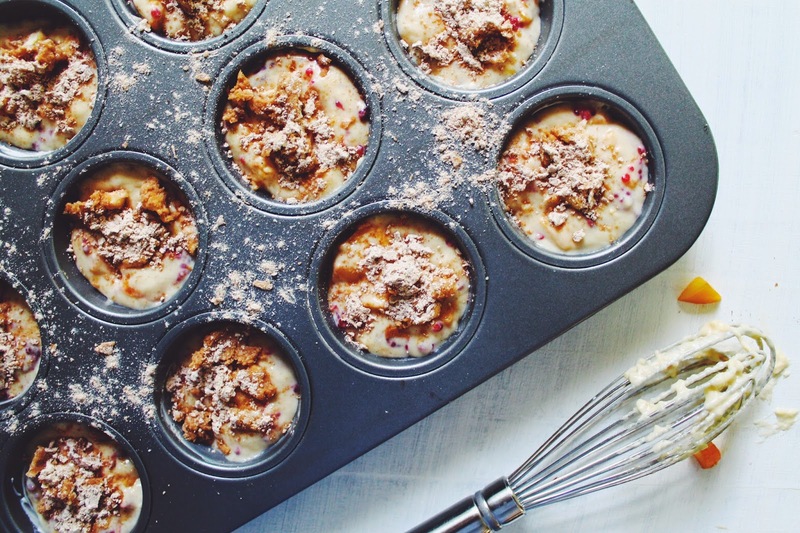 Love your blog and recipes, and sorry to hear of your difficulties. Be aware that drug addictions can cause desperate but otherwise good people to do unthinkable things to people whom they respect and care about. That looks so good! I want some berries! .... if only I had a freezer....and some berry plants!